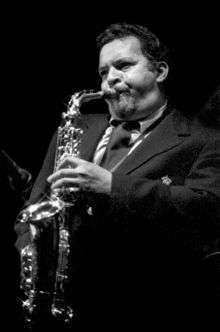 John Lenwood "Jackie" McLean (May 17, 1931 – March 31, 2006) was an American jazz alto saxophonist, composer, bandleader, and educator, and is one of the few musicians to be elected to the Down Beat Hall of Fame in the year of their death. McLean was born in New York City. His father, John Sr., played guitar in Tiny Bradshaw's orchestra. After his father's death in 1939, Jackie's musical education was continued by his godfather, his record-store-owning stepfather, and several noted teachers. He also received informal tutoring from neighbors Thelonious Monk, Bud Powell, and Charlie Parker. During high school he played in a band with Kenny Drew, Sonny Rollins, and Andy Kirk Jr. (the tenor saxophonist son of Andy Kirk). Along with Rollins, he played on Miles Davis' Dig album, when he was 20 years old. As a young man McLean also recorded with Gene Ammons, Charles Mingus on the seminal Pithecanthropus Erectus, George Wallington, and as a member of Art Blakey's Jazz Messengers. McLean joined Blakey after reportedly being punched by Mingus. Fearing for his life, McLean pulled out a knife and contemplated using it against Mingus in self-defense. He later stated that he was grateful that he had not stabbed the bassist. His early recordings as leader were in the hard bop school. He later became an exponent of modal jazz without abandoning his foundation in hard bop. Throughout his career he was known for a distinctive tone, akin to the tenor saxophone and often described with such adjectives as "bitter-sweet", "piercing", or "searing", a slightly sharp pitch, and a strong foundation in the blues. McLean was a heroin addict throughout his early career, and the resulting loss of his New York City cabaret card forced him to undertake a large number of recording dates; consequently, he produced an extensive body of recorded work in the 1950s and 1960s. He was under contract with Blue Note Records from 1959 to 1967, having previously recorded for Prestige. Blue Note offered better pay and more artistic control than other labels, and his work for this organization is highly regarded and includes leadership and sideman dates with a wide range of musicians, including Donald Byrd, Sonny Clark, Lee Morgan, Ornette Coleman, Dexter Gordon, Freddie Redd, Billy Higgins, Freddie Hubbard, Grachan Moncur III, Bobby Hutcherson, Mal Waldron, Tina Brooks and many others. In 1962, he recorded Let Freedom Ring for Blue Note. This album was the culmination of attempts he had made over the years to deal with harmonic problems in jazz, incorporating ideas from the free jazz developments of Ornette Coleman and the "new breed" which inspired his blending of hard bop with the "new thing": "the search is on, Let Freedom Ring". Let Freedom Ring began a period in which he performed with avant-garde jazz musicians rather than the veteran hard bop performers he had been playing with previously. His adaptation of modal jazz and free jazz innovations to his vision of hard bop made his recordings from 1962 on distinctive. McLean recorded with dozens of well-known musicians and had a gift for spotting talent. Saxophonist Tina Brooks, trumpeter Charles Tolliver, pianist Larry Willis, trumpeter Bill Hardman, and tubist Ray Draper were among those who benefited from McLean's support in the 1950s and 1960s. Drummers such as Tony Williams, Jack DeJohnette, Lenny White, Michael Carvin, and Carl Allen gained important early experience with McLean. In 1967, his recording contract, like those of many other progressive musicians, was terminated by Blue Note's new management. His opportunities to record promised so little pay that he abandoned recording as a way to earn a living, concentrating instead on touring. In 1968, he began teaching at The Hartt School of the University of Hartford. He later set up the university's African American Music Department (now the Jackie McLean Institute of Jazz) and its Bachelor of Music degree in Jazz Studies program. His Steeplechase recording New York Calling, made with his stepson René McLean, showed that by 1980 the assimilation of all influences was complete. In 1970, he and his wife, Dollie McLean, along with jazz bassist Paul (PB) Brown, founded the Artists Collective, Inc. of Hartford, an organization dedicated to preserving the art and culture of the African Diaspora. It provides educational programs and instruction in dance, theatre, music and visual arts. The membership of McLean's later bands were drawn from his students in Hartford, including Steve Davis and his son René, who is a jazz saxophonist and flautist as well as a jazz educator. Also in McLean's Hartford group was Mark Berman, the jazz pianist and broadway conductor of Smokey Joe's Cafe and Rent. In 1979 he reached No. 53 in the UK Singles Chart with "Doctor Jackyll and Mister Funk". This track, released on RCA as a 12" single, was an unusual sidestep for McLean to contribute towards the funk/disco revolution of the late 1970s. Many people, at the time, in the clubs where it was played confused the female singers on the track with his name thinking he was actually female. He received an American Jazz Masters fellowship from the National Endowment for the Arts in 2001 and numerous other national and international awards. McLean was the only American jazz musician to found a department of studies at a University and a community-based organization almost simultaneously. Each has existed for over three decades. After a long illness, McLean died on March 31, 2006, in Hartford, Connecticut. In 2006, Jackie McLean was elected to the DownBeat Hall of Fame via the International Critics Poll. He is interred in Woodlawn Cemetery, The Bronx, New York City. Derek Ansell's full-length biography of McLean, Sugar Free Saxophone (London: Northway Books, 2012), details the story of his career and provides a full analysis of his music on record. McLean's track, "Jacknife", from the 1965 Blue Note album entitled Jacknife was used in the Sons of Anarchy episode, "Suits of Woe". ↑ Roberts, David (2006). British Hit Singles & Albums (19th ed.). London: Guinness World Records Limited. p. 341. ISBN 1-904994-10-5. Official history of the Artists Collective Inc.
History of the Artists Collective Inc.